Thirty years ago, a production run fit in the back of a Dodge Colt. My father's, in fact, as he drove tirelessly around the Midwest selling clothes to boutiques and regional department stores. Since then, most local boutiques have gone extinct, and regional retailers have merged their way into an international mass market. Now, most men's shirts below $100 are mass-produced in the thousands and distributed globally. We set out to make a production run that fits in a Dodge Colt again. Every .Bk shirt is crafted & numbered in a limited edition of 100 pieces or less. Because you shouldn't have to share your style with thousands of people. 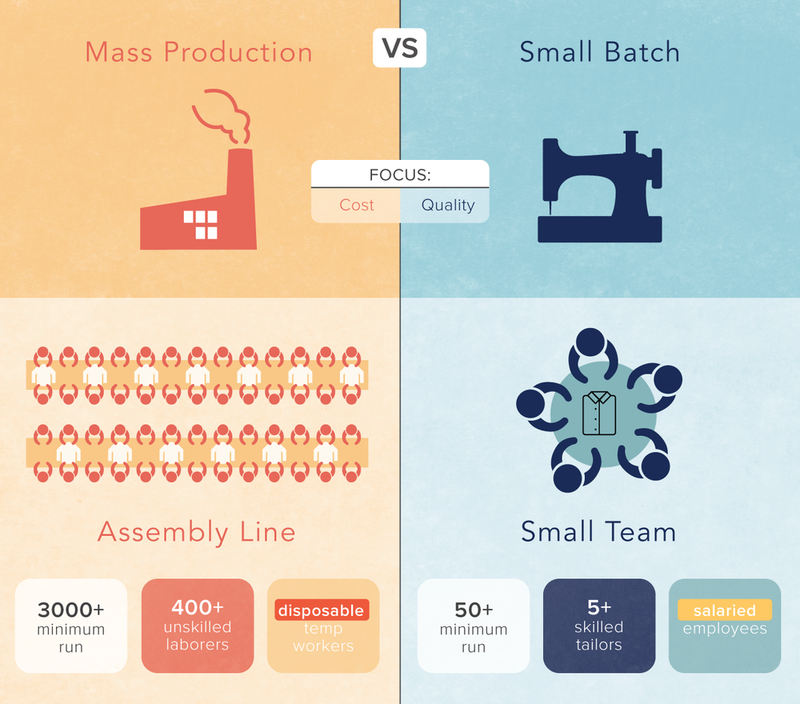 Small batch has the two ingredients missing in assembly line production: time & skill. Whereas hundreds of unskilled workers are involved in the mass production of one button-down shirt, a small batch shirt is crafted by 1-2 skilled, salaried tailors who work to achieve the best possible quality. We sourced to retailers for over 35 years. Now we're sourcing directly to you online. Despite the increased costs of small batch production, we can offer unique clothing at a better price & quality than mass-produced luxury competitors. Our mission is to make clothing personal & authentic again. So we threw out market trends & color forecasting and looked around our beloved home in Brooklyn. To design each collection, we explore unique ways of living in Brooklyn and beyond. We're not out to make a good enough shirt for thousands of people. We're out to make unique shirts for unique people. Sign up with your email address to receive news about new products, events, and exclusive deals.